What Is Competitive Analysis and Why Do You Need It? 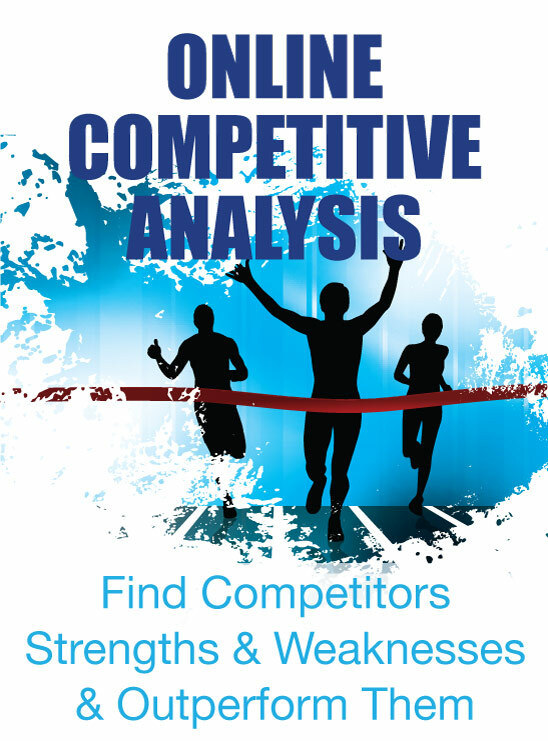 Identify Strengths & Weaknesses of your Competitors and Outperform Them! If you were tasked with jumping higher than a competitor, wouldn’t it be easier if you could stand on their shoulders before jumping? We are about to teach you how to climb onto the shoulders of your competitors. You are about to gain a significant advantage by learning to run and interpret a few simple reports that will tell you exactly what strategies your competitors are using and how much success they are having. In this course you will learn to identify who your online competitors really are, how much traffic they are driving to their website through search engines, advertising and other sources. You will learn how to run a full site analysis and content audit so that you can identify how much relevant content your competitors have created and how that information is being presented. You will learn to run ranking reports, backlink reports, AdWords campaign reports and gather social data on any competitor. You will learn to use this data to find the strengths and weaknesses of your competitors and that information will become your blueprint to creating the most dominant web presence in your market. Identify your top online competitors in Google organic search, AdWords and Social Networks. Run organic ranking reports to learn what terms and pages are driving traffic to your competitors and why. Run simple reports that will give you a visual sitemap and complete SEO site audit for any competitor, so you know to what level your own site must perform. Run backlink reports for any competitor so that you know what links are supporting their organic rankings and sending referral traffic. Run AdWords campaign reports for any competitor so you know what ads they are running, how much they are spending and how much traffic they are driving. Analyze the social profiles for your competitors to gauge the popularity of social in your niche and plan your strategies accordingly. Download the Workbook and learn to format information into the most powerful competitive analysis tool in the industry! One of the most common questions clients ask their SEO agency is: "What ROI can we expect?" and the truth is that most SEO agencies cannot honestly answer this question. However, this competitive analysis is the best tool in existence to tell you how much success your competitors are having and what resources are driving that success. This is the best information you can possibly use to predict your opportunity for ROI. Do you want to know what level of success you can reasonably expect and how long it will take to get there? Then what are you waiting for?